Do you want to get your documentary made as soon as possible? Too many documentary proposals are unprofessional, lack the correct information and turn off wealthy donors and potential funders right at the start. We've searched and there's nothing else like this Documentary Proposal Template Pack. If you want an effective money-winning proposal you're in the right place. 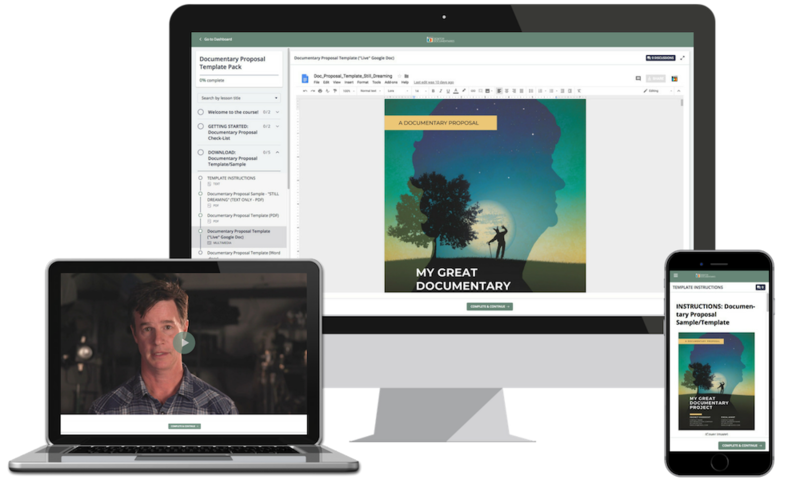 The Documentary Proposal Template Pack is a comprehensive, step-by-step fundraising tool that helps you pitch your documentary project to potential major funding partners including corporations, private investors and foundations. Created by award-winning documentary team Hank Rogerson and Jilann Spitzmiller, they've raised more than $1-million for their documentary projects. In addition Jilann serves as a grant funding judge -- analyzing hundreds of filmmaker proposals. Together, Hank and Jilann are giving you their best strategies, proposal samples, letters and templates all packaged into ONE comprehensive step-by-step system to help you create a money-winning proposal. A 15-part video series takes you step-by-step through the proposal writing process, whether it's to a small foundation or a major documentary funder. A quick-start/pre-formatted proposal template, fundraising letter samples and a real-world money-winning proposal sample to use as reference to craft your own proposal. Helpful assignments, worksheets and prompts take you step by step through each section of the proposal to help you write your proposal word by word.